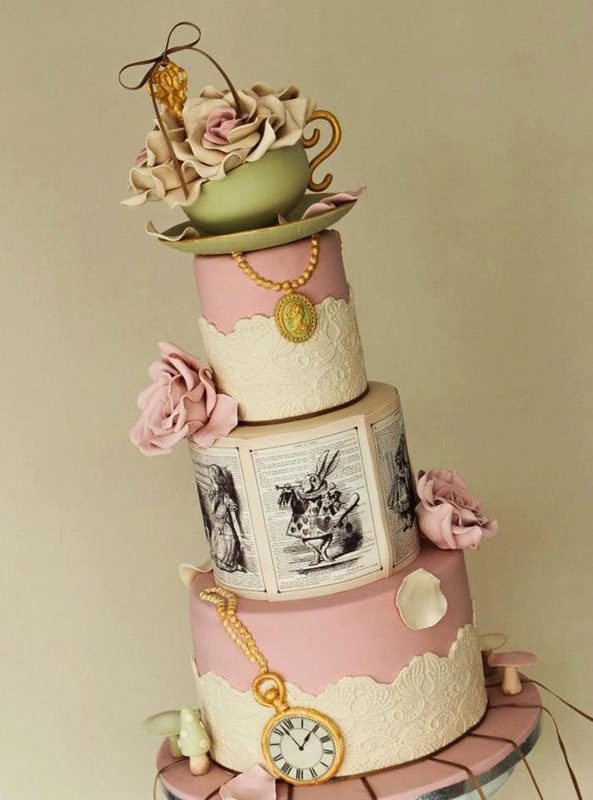 Are you a huge fan of Alice in Wonderland? 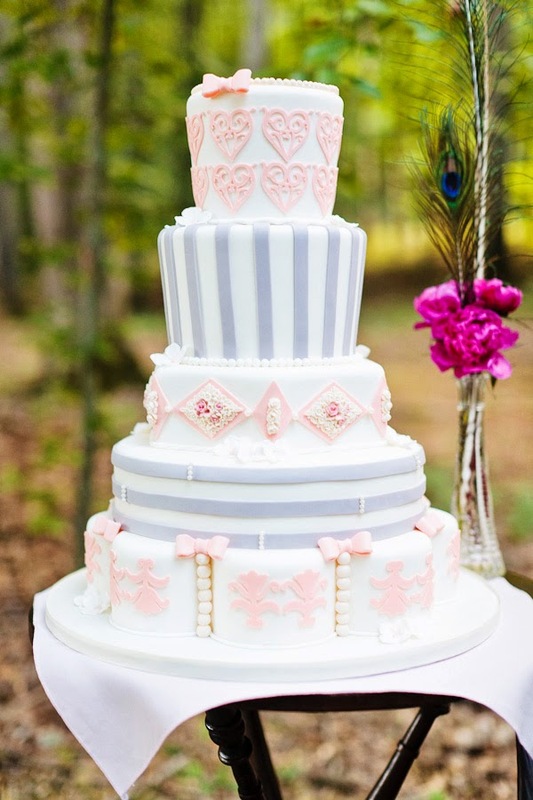 Then this is the wedding theme for you! The invitation you receive has a small round circle on the back, it's of dark blue and has white printed on it, the words of course say "Open Me" in nice readable script. Who wouldn't open such a delightful little message that's addressed to you? When you open the envelope a very fun, colorful invitation is revealed. 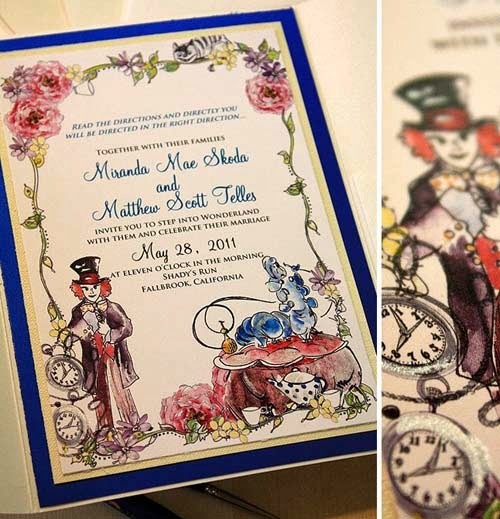 The wedding invitation is of blues, yellows, greens and pinks, all together in gentle, whimsical pastels. 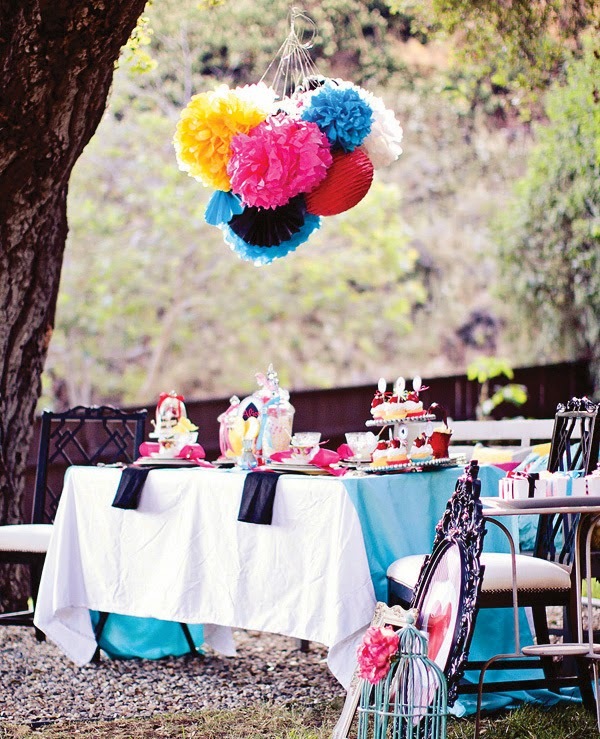 By the sounds of it, you have been invited to wedding and tea, so wear your best attire with a splash of color. The wedding date has arrive, it's an outdoor wedding on a nice spring day, being held outside in the garden with vast amounts of flowers, lush green grass, and water fountains. You follow the signs that say "This Way" and "That Way" to the area that the wedding is being held. As you arrive you notice green, blue, pink, and yellow paper lanterns. The seats are basic, with little signs saying "Sit Here" or "Sit on Me" hanging off from the side. 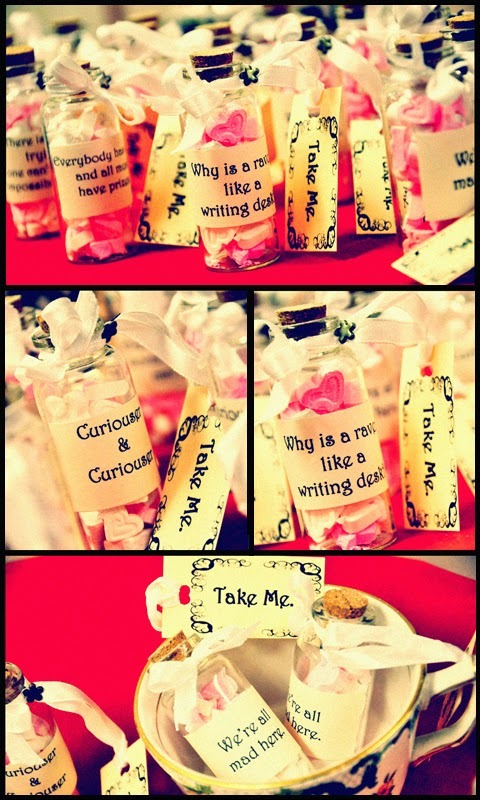 This is surely a curious wedding! Everything has an opinion on what it wants you to do. Playing cards are spread everywhere, at random and even some extra flowers from the garden that Alice stumbles upon. 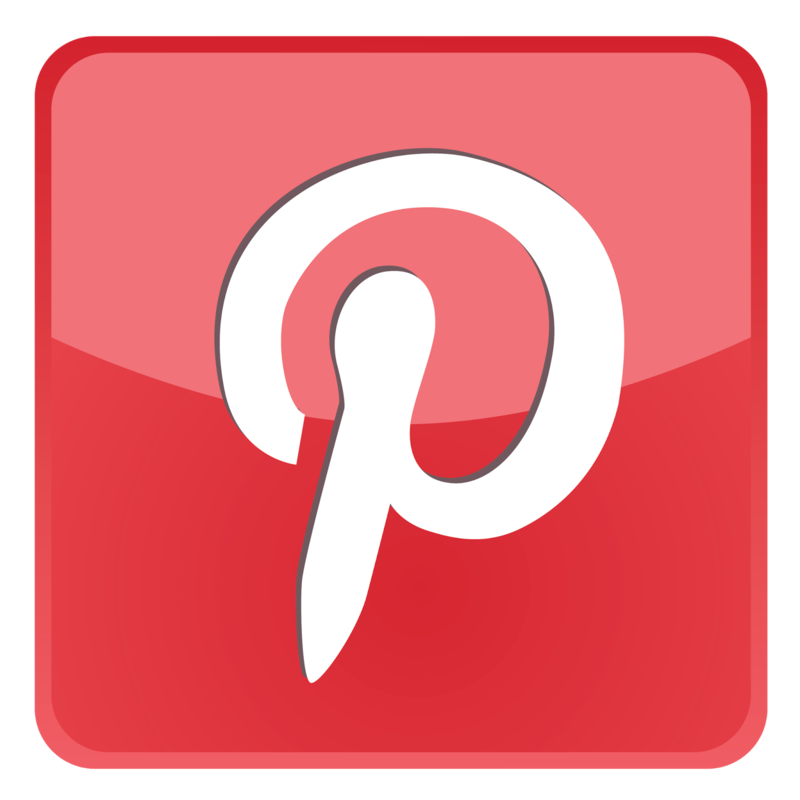 A little girl dressed in a light blue dress, with a little white sash around her middle and a headband skips down the aisle, dropping flowers with every skip. Before she is fully down the aisle, the bridesmaids and groomsmen start to walk down the aisle as couples. The dresses of the bridesmaids are the same gentle pastel colors as the invitation, except for one who must have been the Maid of Honor, the men in tux with ties that match the bridesmaid they are walking with. One of the groomsmen, the best man, appears to have a rather large hat- a formal Mad Hatter. 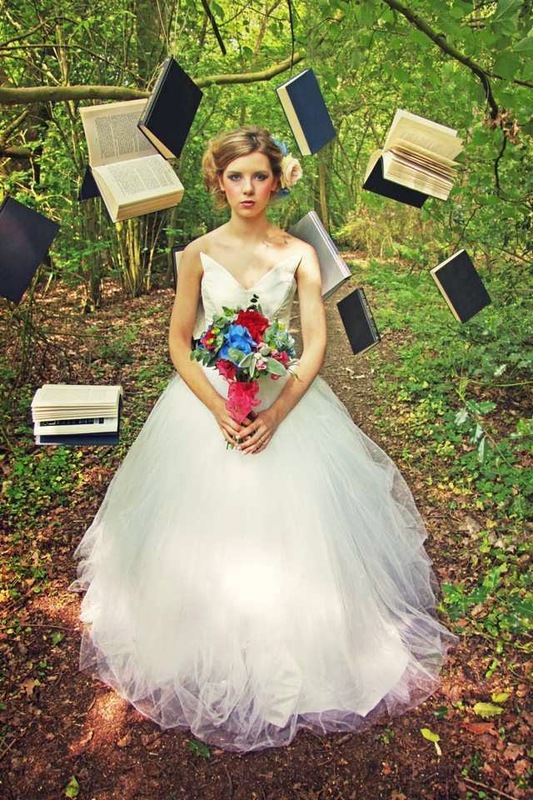 Finally the bride walks down the aisle, she's stunning in a fairytale dress with her hair done with flowers. The groom is wearing a stunning tailed tux, white button up shirt with a dark red vest, and a black tie as he waits for his bride to arrive. They are certainly the King and Queen of hearts, since the bride has a bunch of dark red roses and the groom has a single red rose pinned to his coat. As the wedding ceremony ends, the party is just starting. You, and the rest of the guests, are ushered to a different part of the garden where there are tents and dance floors set up. A band is already playing on a mini-stage. The place is covered with little colorful lanterns and vases spilling with flowers. 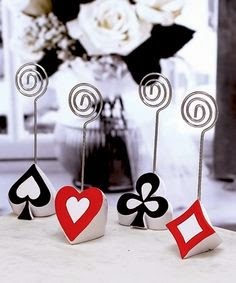 On the tables, which are covered by different colors following the same pattern as before, are Las Vegas Wedding Poker Place Card Holders with a name on each one. Two of a Kind Playing Card Favors are also on the tables, along with tea cups that say "Drink Me" on a card and a bunch of cupcakes and cookies that say "Eat Me" on the platter. As the guests eat and drink, they notice Seed Wedding Favors 'Love Grows' under their cups- a lovely addition for the garden wedding and the perfect party favor. 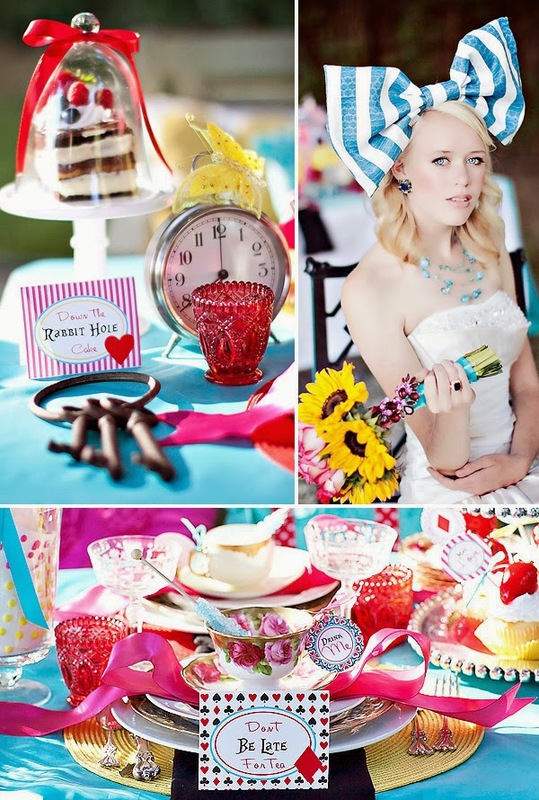 This is one tea party that the real Mad Hatter will want to go to! Everyone enjoys the games, food, drinks, and music until the night comes up- and even then those lovely colored paper lanterns extend the party away. 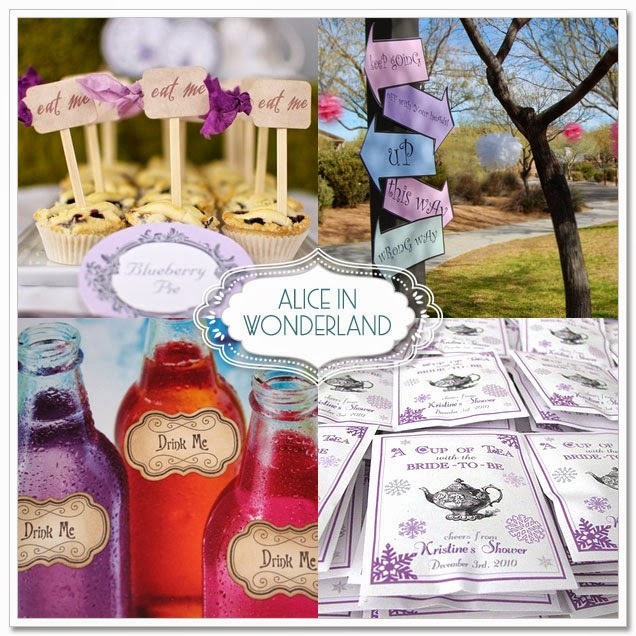 Surely, this wedding is one that you will never forget and for Alice in Wonderland fans, a wedding theme your guests will long remember.